Rounds 3 through 10 of the 2015 MLB Draft concluded on Tuesday, and there wasn’t a ton to get excited about on the Dodgers’ end. If anything, the Day 2 picks showed they either needed to save some money to pay for their first three picks, or they have something up their sleeve in rounds 11 through 40 (which is currently underway). Here’s a look at the eight players chosen by the Dodgers on Tuesday. Oh look, another Vanderbilt pitcher! But this time, he’s truly a reliever and has very little chance to be a starter. Pfeifer is an older prospect (as a redshirt junior), small frame (6’0, 195 pounds) and doesn’t offer a ton of upside. John Manuel of Baseball America threw a J.P. Howell comparison on him, and that seems to be his ceiling. Howell began his career as a starter and is now a solid lefty out of the bullpen. Pfeifer has more velocity on his pitches than Howell, as his fastball checks in at 90-91 MPH. That was as a starter, so he probably has a little bit of reach-back velocity once he’s in the bullpen full-time. He has a curveball and changeup that give him a borderline starter’s repertoire, but he’ll be much more effective as a reliever. He has average command and doesn’t have a ton of upside. He might be a money-saving pick at this rate (even if if it’s only a 5-digit savings). He should begin his career in Ogden with a chance to move quickly if he’s a reliever. The Dodgers might send him out as a starter in the beginning. First of all, that’s a made-up school. Second, Calhoun has a lot of power. That’s really about it. Sure, he put up video game numbers at this Arizona junior college (.432 batting average, 31 home runs in 63 games), but don’t get your hopes up. Calhoun is only 5’9, 180 pounds, but he uses a short swing to generate surprising power potential (mostly to the pull-side). He has a big-man swing, complete with toe-tap and significant load. Defensively, he probably won’t stick at second base. He’ll likely end up in left field and will need to hit to have any kind of big-league future. Also, this doesn’t bode well for future success. Calhoun was clearly overmatched by Phil Bickford in JUCO playoffs. Phil Bickford was the Giants’ 1st-round pick. He has talent, but he was far from the best pitcher available in the draft. It’s not really surprising to see he struggled against much better competition, and that’s what he’ll face in the pros. Finally, a high schooler! And a potentially good one. Davis is the definition of lanky (6’4, 155 pounds). One could argue he’s the definition of projectable as well. The prep infielder fell to the fifth round after suffering a fractured wrist in February. He’s committed to CSU Fullerton, but I suspect the local kid will sign with the Dodgers — probably for more than the slot-recommended amount. He’s already taken a photo and posted it on Twitter of him in a Dodger hat. His Twitter cover photo is also a shot of Dodger Stadium from behind the plate. Davis has an unpolished swing at the plate. It’s long at times and he tends to drop his back shoulder, leading to some weak fly-ball contact. When he puts a good, level swing on the ball, it explodes off his bat. You can see the potential there. Once he adds some weight to his skinny frame, the power should come. Coupled with professional instruction, Davis could end up being quite the get for the Dodgers in the fifth round. He has a really strong arm, as he has been clocked in the low-90s on the mound. He has plenty of arm for shortstop, but his long legs might prevent him from having a enough of range to play the position. He has enough athleticism and instincts to handle the hot corner. If not, he should be able to play the outfield (perhaps center field?) with enough bat. He’s going to take a larger commitment than the slot amount, which is why some of the picks down the page are cheap signs. He’ll probably go to the Arizona Rookie League. Rios is a big first baseman from Florida International. He doesn’t offer a ton of upside, but he should have some power from the left side. He looks like a power-hitter at the plate, complete with an open stance, long swing and finish. He isn’t much on the defensive side (limited to first base or left field) and doesn’t have a ton of speed. Pretty typical organizational depth selection. He should sign for slot or just a little less than it and go to Ogden to begin his career. Sopko is a junior from Gonzaga, and he might be a nice little get for the Dodgers in the seventh round. He has good size at 6’2, 220 pounds and started at Gonzaga. He’ll likely begin his career as a starter, but he’ll probably end up as a reliever. He touches 94 MPH as a starter but sits in the 88-92 MPH range. He also has a slider and changeup that are average at best. His command needs improving as his delivery is a little stiff, but he might be an interesting relief prospect in the mold of J.D. Underwood (2012 5th-rounder, drafted as a starter, flourishing as a reliever). He’ll probably sign for slotish money and begin with the Raptors in Ogden. Two really good back-to-back names in Sopko and Bergjans. Bergjans isn’t physically imposing (6’1, 190 pounds), but he gets the most out of his stuff. He holds the Haveford College record for most career strikeouts and led Division III schools in strikeouts, if you put any stock into that. He has a fastball and breaking ball (a slider, I think) and is a relief prospect in the pros. As a senior draftee, he should be the cheapest Dodger signing so far. He’ll be Ogden-bound, most likely. No, not that Kevin Brown, but this right-hander has a big fastball and is a relief prospect. He has good size (6’3, 210 pounds) and was a junior at CSU Dominguez Hills (which apparently has a baseball team). He has a mid-90s fastball that is his best pitch. He has a solid delivery and is organizational depth for now. He could go to Ogden or Great Lakes and should be a below-slot signing. 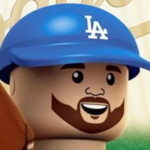 A 2-way player in school, the Dodgers announced him as a center fielder. He’s 6’2, 180 and has some athletic ability. The last three Dodger 10th-round picks have signed for a combined $12,500, so I’m assuming Landon will be a cheap sign as a senior draftee. If the video below is any indicator, he’ll need some work on his swing (despite hitting a home run). He’s organizational depth, much like a handful of selections from the second day of the Dodgers’ draft. He should go to the AZL or Ogden. That’s it. The third day of the draft is underway, and the Dodgers took Madison High School right-hander Imani Abdullah with their 11th-round pick. I like it, and the Dodgers have been successful with 11th-rounders in the past (hi, Joc Pederson).